ST. LOUIS, March 21, 2019 /PRNewswire/ -- Nestlé Purina PetCare Company continued its commitment to supporting individuals, communities and our planet in 2018 through providing more than $31 million in funding, Purina pet food and Tidy Cats litter to nonprofit organizations across the country. "At Purina, we're guided by a core belief that people and pets are better together," said Joseph Sivewright, Purina CEO. "That's why we've stepped up our commitment to organizations and programs that help keep people and pets together, as well as those that bring people and pets together through pet adoption and programing that promotes the benefits of pet ownership." Purina has long supported pet welfare organizations. In 2018 the company provided more than 12 million pounds of pet food and cat litter to pet shelters across the country. These donations provide high-quality nutrition to more than 187,000 pets through Purina's Shelter Champion partners. The company also supports the Petfinder Foundation through a number of annual campaigns that generate grants for Petfinder shelters and subsidize more than $100,000 in pet adoption fees. Last July 4th Purina Dog Chow launched the Service Dog Salute campaign to bring together rescue dogs with veterans experiencing PTSD, and guide veterans through a ten-month program to train dogs to become their own psychiatric service dog. 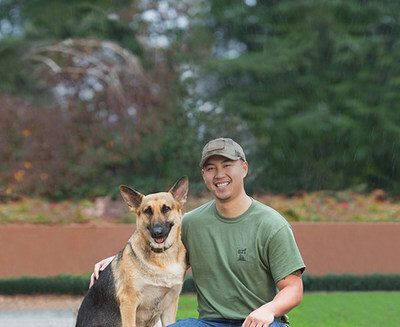 As a longtime supporter of the U.S. military, Purina Dog Chow knows the impact service dogs can have on the lives of our veterans, providing them with stability and companionship as they readjust to civilian life. The brand donated $500,000 to the service dog training program at Tony La Russa's Animal Rescue Foundation (ARF) to help fund an expansion that will reach veterans in need. 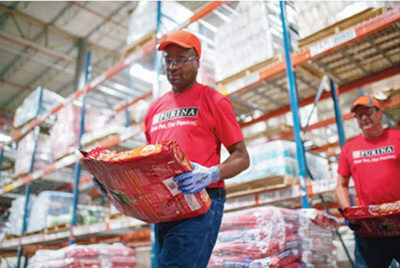 Supporting communities in need when a natural disaster strikes continues to be a key priority for Purina. In 2018, the company partnered with GreaterGood.org to send more than $60,000 to aid victims of natural disasters, and also worked with Rescue Bank, a national pet food bank and program of GreaterGood.org, to distribute more than 60,000 pounds of pet food and litter to pet shelters and owners in need. Efforts included sending relief to communities affected by Hurricanes Michael and Florence, as well as the California wildfires. "As a pet care leader, we know it's our responsibility to improve the lives of pets and the people who love them," said Bill Etling, Director of Purina Public Relations and Community Affairs. "We support our community partners in many ways -- including through providing funding and pet food and contributing our expertise in pet care. We're fortunate to work with some of the country's leading nonprofit organizations that are making a measurable, positive impact in support of individuals, communities and our planet." The bond between pets and their owners is unbreakable, but the lack of pet-friendly domestic violence shelters leaves many victims with a heartbreaking decision – stay in an abusive relationship with their beloved pet, or leave their pet behind. Today, only roughly 10 percent of domestic violence shelters in the United States allow pets, and nearly half of victims (48%) will stay with their abuser in fear of what will happen to their pet if they leave. In 2018, Purina joined forces with RedRover to raise awareness of the issue and develop a program to help bridge this gap. The Purina + RedRover Purple Leash Project, announced early this year, will provide grant-based funding to help domestic violence shelters become pet-friendly so domestic abuse victims can escape with their pets and begin to heal together as survivors. Purina is committed to serving youth through several programs that develop leadership skills through lessons in humane education. This work ladders up to Nestlé's education and career acceleration initiative Project Opportunity, which helps people gain work experience and strengthen their development skills. Through supporting programs like the Mutt-i-grees Curriculum, Purina is helping develop calm, confident and caring kids to foster a more humane future for all. The social emotional learning curriculum was developed by Purina's partners at North Shore Animal League America (NSALA), in conjunction with Yale School of the 21st Century, and often includes bringing shelter pets into the classroom to help engage students. For more than 50 years Purina has been supporting the United Way in its mission to improve lives by advancing the common good in communities across the world. Purina's annual pledge drive supports local United Way chapters in St. Louis and its manufacturing plant markets. For the past 10 years, Purina and its associates have generated more than $1 million annually for the United Way of Greater St. Louis, 100 percent of which is passed on to local nonprofits serving the community. Nestlé Purina continued its commitment to a healthier planet through contributions to organizations like The Nature Conservancy and Ducks Unlimited. In May Purina collaborated with The Nature Conservancy and Cargill to launch a three-year water conservation project designed to reduce the environmental impact of row crop irrigation in Nebraska and ultimately improve the sustainability of the beef supply chain. This project is expected to provide a scalable irrigation solution for farmers across the U.S. In August Purina announced a partnership with Ducks Unlimited that will protect and improve 1,600 acres of wetland and grasslands across Iowa over the next three years through Ducks Unlimited's Living Lakes Initiative. Programs like these promote the efficient use of our natural resources to help ensure a healthier future for both pets and people. To learn more about causes Purina supports, visit www.purina.com/about-purina/supporting-communities. Nestlé Purina PetCare promotes responsible pet care, community involvement and the positive bond between people and their pets. A premiere global manufacturer of pet products, Nestle Purina PetCare is part of Swiss-based Nestle S.A., a global leader in nutrition, health and wellness.